I wrote this story for a student in our college who found it very hard to talk to others. Walter didn’t think he had any friends. People were kind to him in general but he was usually alone. He worked in a large department store, sweeping up. Every Monday he had to sweep the whole of the top floor. On Tuesdays he had to work in the basement, sorting out the bins. He liked Wednesdays best. He worked on the second floor in the toy department every Wednesday. After the customers and staff had gone home, Walter had the toy department all to himself. If he worked fast he could clean all the empty shelves and sweep round all the counters and have a whole hour to spare. How he loved that hour! Walter considered himself to be a very thoughtful person. His mother had told him so early on in his life. Walter’s mother was a kind woman. She would notice Walter staring out of the window, or into open space for many minutes at a time. Sometimes he would stare at one of his toys for ten whole minutes as if he was trying to work out how it was made. He would turn it over and over in his hands. Now Walter could look at any toy for as long as he liked. He was in heaven. Sometimes he would even take the toys out of their boxes and line them up in rows. He particularly liked the remote controlled toys. They made him feel like a god or a king. He was in control. It was a feeling he didn’t have in his normal life. It seemed like everyone else was in control, not him. But he didn’t mind too much. Mostly people were kind, but they got cross if he forgot to do things. One evening when Walter was on his favourite floor and he had finished work early, he was about to look at the very latest remote controlled toy in the shop. Someone came in over by the stairs and stood looking at him. It was a boy, about his age, holding a mop. He looked lost. Walter wasn’t sure what to do or what to say. He wasn’t very good at being the first one to speak, so he just stared back. The two boys looked at each other for a long time. Walter felt a bit excited. He had wanted to show someone else all these marvellous toys for a while, but thought it might get him into trouble. Eventually the boy took a step forward. “Hello,” he said. “I’m supposed to clean the toilets on this floor, then I’m off home. Can you tell me where they are? The boy came closer. “Wow, cool. Can I have a go?” He pointed to one of the remotes. The two lads moved their robots around the floor. Nothing else mattered. Finally Walter’s watch bleeped. “I will,” said the boy as he disappeared with his mop. Walter felt a warm glow spreading through his chest. He had found a friend. He didn’t even know the lad’s name but he knew he liked him. He was thoughtful and quiet. He had packed away the toys carefully and made sure that everything was in its place. Walter knew his mum was teasing when she said he was thoughtful. “Full of thoughts,” she said. But he also knew the other meaning of the word and he was that too. He thought about what other people would like, and tried to make sure others were happy. Sally put her hair in a pile on top of her head. She fixed it quickly. It would have to do. There was no time for fiddling about. There was a train to catch, a ten-minute walk to catch it, and she was running late. It happened so often that she was sick of it. Why did she do it? She had an alarm clock, she set it, it rang, she switched it off and went back to sleep. If it weren’t for her neighbour slamming the car door she would still be asleep. Sally dashed round the flat: bag, raincoat, bottle of drink, bag of crisps, banana, that would have to do. She raced down the outside steps. Had she locked the front door? She couldn’t remember. She’d have to check. Up the stairs, check the door, not locked. Lock door, go. Sally flew along the road. She hated running in the rain. Her coat flapped round her legs. Eight minutes to go. Mike grunted as his repeater alarm started up for the second time. Better get up. He mentally planned what he had to do before leaving the house. He liked to have plenty of time. He hated to rush. As he showered he recalled that it would be Sally’s birthday tomorrow. Must remember to get her something worthwhile, something that would remind her of him, and a treat as well, perhaps a box of chocolates. Mike’s clean clothes lay on the chair where he had put them the night before. He dressed quickly and went downstairs. While he ate his breakfast he watched the news – not very interesting today. His mind turned to Sally – crazy girl, but he couldn’t help liking her. What on earth could he get to give her tomorrow? Mike took food out of the fridge: cheese, cucumber, tomato, bread. He made his lunch plus an extra sandwich for Sally in case he was going to be lucky enough to see her today. He checked his teeth in the mirror after brushing out the breakfast bits. OK, everything was OK. He slammed the front door and locked it. “My next door neighbours cat rushed in as I was going out and I couldn’t find it. It was hiding in my linen basket,” and so on. Her excuses were wearing a bit thin. Her job might be on the line. Mike felt his stomach tighten. If she lost her job maybe he would never see her again. After all they had only ever chatted on the train. Then he remembered the birthday. She had mentioned it in passing the previous day. He had a brain wave. He’d get her a repeater alarm clock like his. It starts quietly and when you switch it off it lets you snooze for three minutes then it comes on again, only louder, and it keeps doing that until you get up and switch it off properly. He would get one in his lunch break and give it to her after work that very day. She’d have no excuse then. She’d have to get up on time. She said her mum used to get her up when she was living at home, but now in the flat she was independent and although it was great, it wasn’t easy. 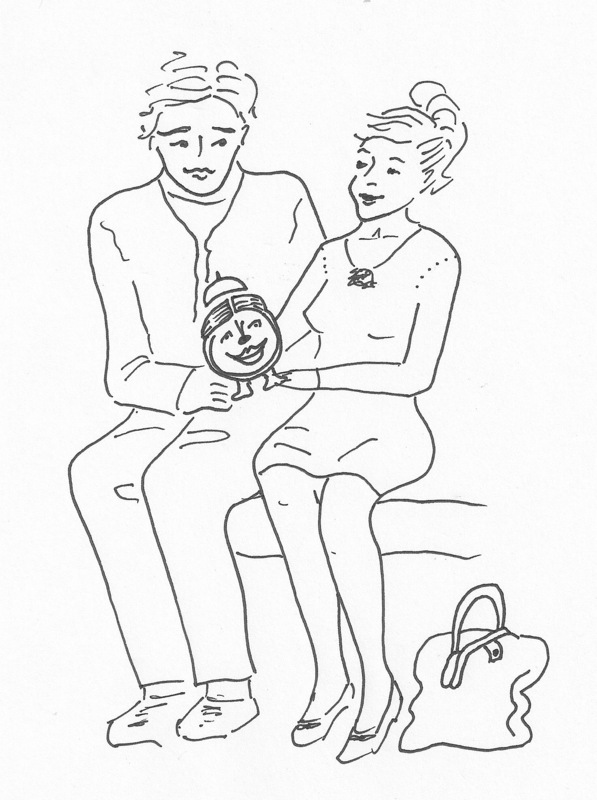 Sally grinned sheepishly as she stepped on to the train home. There was Mike waiting for her. He had saved her a seat. He offered her sandwich; he had kept that too just in case. “You are going to take this birthday present and never be late again!” said Mike triumphantly. Sally opened the small parcel. There was a pink plastic alarm clock with a bell on the top. It was made to look like a woman’s face with a big smile on it. Sally thought it looked a bit like her mum. “It’s a repeater – it will keep coming on until you get up!” Mike grinned. 1. What do you think is the most important message in this story? 2. Does this story remind you of anything in your life? 3. How do you feel when you are late up and there isn’t enough time to do what needs to be done? 4. How do you feel when you have plenty of time in the mornings? 5. What is it like to miss breakfast? 6. What do people look and feel like when they haven’t cleaned their teeth or washed themselves before they leave home to go to College or work? 7. How do you feel about people who always look clean and tidy and who smell fresh? Is that you? 8. How could you improve on what you do in the mornings to make yourself feel better during the day? If you enjoyed this post, please press the like button! A story for people who are compulsively competitive. I meditated for a story for a friend who told me that she was annoyed with herself for being so competitive, especially with regard to riding horses.She said it was spoiling her enjoyment of her horse and her riding experience.She asked me if I could get a story to help her. A gentleman wearing jodhpurs came into my meditation.He was from another era – probably the turn of the last century. Hunting is a thrilling pursuit. I spent half my life either thinking about it or doing it.It led me into all manner of difficulties.My horse had to be the very best and my garb immaculate.I had to gallop faster than anyone else, spy the fox before anyone else, and be in on the kill. Hunting was my master.It ruled me and my enjoyment of life. I had children but they were naught to me when there was hunting to be had.My family could go hang.My old father observed my ways.He had been a huntsman himself.The antlers in the hall bore witness to that fact.In the beginning he encouraged me.He knew the thrill of the chase, the smell of the horses sweat, the sight of its steaming breath in the cold air.He loved the lunge and the leap – hedges and ditches – the risk of the roll, the joy of success.But what he saw in me was the pain of failure, the anger of not being first or of not having the proudest steed.He saw my disappointment. “Son,” he said, “you are missing the point.You are missing the experience.You goals are too narrow and cannot be hit, and if you hit one goal you may miss another and still be disappointed. Feel the speed. Breathe the air. Talk to your beast. Enjoy the moment, that is the point. Forget the others. Allow them their experience. Whether they win or lose it matters not.Whether you win or lose is not the object. Being there is the whole purpose. And taking this different viewpoint I found it was indeed so. Can you think of examples of where competition is a good thing? Think of some examples of competitiveness causing problems for people. People live in many different sorts of homes. In my country people live in houses, flats or rondavels. These are round houses made with clay and sticks, with thatched roofs. They are quite small, but since African weather is so good the poorer people need their houses only for protection at night from wild animals and from the rain. The family in this story lived in a rondavel in a village a very long way from the main road. The people had their own code of ethics, which enabled them to live together in harmony. No one was a murderer; no one was a thief. Although one man may have more than one wife, he chose his wives carefully and took no others, so the children of the wives knew who their father was, and they loved and respected him. In this village no man had more than three wives. Most only had one because they did not have enough land to feed more than a certain number of children. Ah, but I tell a lie, the chief had four wives. The eldest and wisest was his first wife, Bulala. The other wives had to pay attention to what Bulala said, or there would be trouble. Each wife had her own special duties and skills. Bulala was the organiser. There was much work to be done. The ground had to be broken, the crop sowed, the houses must be kept in good order. Then there were the animals, they had to be fed and water had to be fetched every day. Someone had to make and mend the clothes and cook the food. The wives shared the duties out amongst themselves and their children so that everything that needed to be done was done and there was still time for singing and dancing at the end of the day sometimes. The chief was the medicine man and healer. He spent his time talking to the elders and making decisions for the village, meting out justice, and healing the sick. In general the system worked very well indeed, the villagers were happy and healthy. Of course people died every so often, but death is part of life. Those who live must also die. No one wishes to die in pain and suffering, and I think the chief did his best to see that this did not happen to his people. “Ah, let’s ask Mata to do it. Her baby is asleep, she has time now.” There were so many people telling Mata what to do – the chief himself, Bulala, and the two other wives, that Mata didn’t feel that she ever had a moment’s peace, and since she was married to the medicine man himself, she didn’t feel she could complain. She started taking long walks in the bush with her child on her back, just to get away from them all. She would sit under a tree and wait for dusk to fall before returning to the village with a small piece of firewood on her head. The wives would toss their heads angrily. “We have been working all day long and you come home with one miserable stick of firewood, Mata, What is wrong with you?” She would turn away and take her baby off to feed him. The chief loved Mata. She was a kind sweet girl. He could see that she was unhappy and he thought he knew the reason why. He decided he would try to show her how things could be different for her. The next day when she went off to gather wood, he sent a group of young men off to follow her. They kept their distance; she did not notice them at all. She sat in the shade and played with her baby and then she slept. While she was asleep one of the youths stole up to her and picked up the child. The baby was not at all alarmed. He knew the young man very well. When Mata awoke she was horrified to find her child had gone. What should she do? Distraught, she ran back to the village to tell her husband, the chief. She was amazed at his calm reception of this terrible news. “Ah, Mata,” he asked, “How was it that you did not prevent your child from disappearing from you, was he not with you on your back while you were gathering firewood? Then Mata had to tell the truth, she had been asleep. Finally she broke down and explained about how she felt being the youngest wife. “But how can you laugh? Your son is missing and I don’t know where he is?” wailed Mata. At that moment the child appeared in the arms of a smiling young man, Bulala’s eldest son, his own half brother. Mata screamed and ran towards him, overjoyed; the baby held out his arms to his mother who scooped him up and disappeared into her rondavel with him. I was on duty at the hospital; it was shortly after midnight. We had had the usual number of drug overdoses, knifings and violent brawls. I had started work at 6pm and was beginning to get tired. There were three nurses and two doctors on duty at the time. One of the nurses was from Jamaica and of the two doctors one was Indian and the other Nepalese. It was very unusual to have doctors from Nepal in our hospital. Normally after their training they returned to work with their own people, but Dr.Bijay had met and married a British nurse and though he missed his country a great deal, he loved his wife and child and wanted to stay. The two doctors were cool towards each other. Unfortunately they had brought their national tensions with them. The Indian doctor thought that Bijay was too complacent, and Bijay said that Dr. Sanje worked more than was good for him and was too ambitious. The event that occurred that night was to change the attitude of both men. We had spent a quiet half-hour during which time Bijay had read the daily newspaper and Sanje had written up his log when suddenly the double doors to the ward burst open and three people pushed their way in. One, a man had blood pouring down his face. The other two were women, one older, one younger. The man was holding his head in his hands and shaking it to and fro, as if he did not know where to go or what to do. They were followed by two paramedics who had evidently brought them in the ambulance. Sanje jumped to his feet. “What’s going on, what has happened here?” he asked the paramedics. Meanwhile Bijay tried to speak to the man holding his head. “I think there’s been a fight – These women, one’s his wife and the other’s his mother. She’s been screaming at him too, he’s very drunk,” replied the ambulance man. I spoke to the younger one. They were both sobbing and shaking. It turned out that the older woman was the wife’s mother. She lived downstairs and had come to protect her daughter when she heard the husband return home, roaring drunk. She secretly wished him dead, as he was such a brute towards her daughter when he was drunk. On entering the kitchen she had found her daughter holding a knife, and saw blood spurting from the man’s wrist. She knew he would die very soon if he was left alone and she was very tempted to leave him, but she knew this would not be right. No matter how much she disapproved of his drunken ways, she knew she had to save him. She grabbed a tea towel and ripped it in two. The man had collapsed on the floor at this point she tied it tightly round his wrist to prevent any more blood loss. The daughter meanwhile, terrified as she was of her husband in his drunken state, had rushed to call the ambulance. She knew she needed help to mend her relationship with her husband. She had been defending herself, not trying to kill him. We advised her about counselling services that were available and also suggested she join ALERNON, a group that supports the families of alcoholics. Then the next emergency case arrived and the women departed from our ward. The following day I asked Margit, the Jamaican nurse, how the doctors had coped with their patient. She said it had been a useful experience for both of them. When I asked her what she meant she went on to say that by the time they had sorted out his wrist and stitched up his head he had sobered up a lot and became quite talkative. He asked the doctors where they were from. When he discovered that Bijay was from Nepal and Sanje from India he started to weep. Margit didn’t hear the rest of what was said, but she did notice the exchange of a wry smile between the two doctors. This case had a profound effect on the two doctors. Our drunkard had been an immigrant from Nepal, and his wife was of Indian extraction. He had returned to the hospital to say thank you to them for sewing him up so well, and I personally overheard him say how much he loved his wife and why there was no reason on earth why people from two different cultures should argue and fight. He had started to go to ALCOHOLICS ANONYMOUS, and his wife was supporting him in giving up his habit of drinking. He had a new job and his wife was expecting a baby, and he wanted to be a good father to it. The two doctors smiled at each other after hearing this tale. “He’s quite right, of course,” said Sanje to Bijay, and they both shook hands.